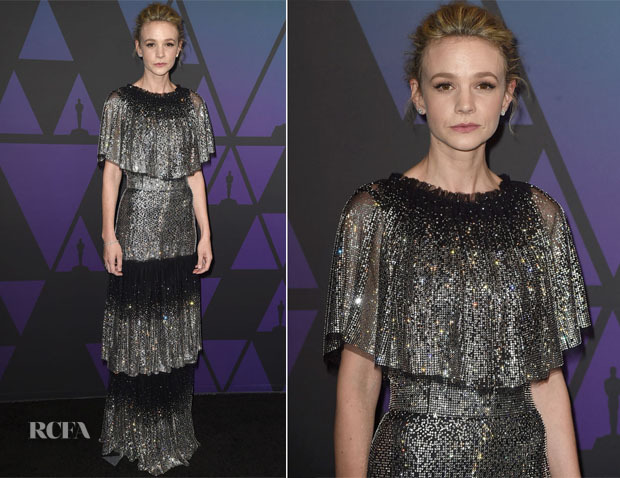 Carey Mulligan looked flawless while attending the 2018 Governors Awards held in Hollywood, California on Sunday (November 18). The ‘Wildlife’ actress wore a Dolce & Gabbana gown for the occasion. When we think of Dolce & Gabbana, lace or floral dresses spring to mind, so this embellished tiered mesh dress feels refreshing, both for Carey and the brand. Since her dress made such a strong statement, I’m glad that she let it take center stage by styling it with barely there makeup and simple stud earrings. I think this might be my favourite look from Carey this year.